Say hello to Avenue, our February 2014 theme release! Avenue is a boxed styled theme with smooth drop shadows, condensed typography and light gradients that will perfectly fit your business, magazine or blog website. It comes with 8 different style variations making it suitable to a broad range of projects. 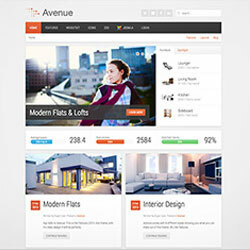 Avenue features a modern box styled layout, classic navbar design and logo position making it look more classic, like a Warp 5 or 6 theme but with modern technologies like full UIkit and Warp 7 support. The different theme styles are include plain background colors and nifty background graphics. Additionally you can select a special boxed content style which can be turned on and off. Avenue is based on Warp 7 and provides full support for LESS. The front-end is completely built with UIkit and can be modified through the Customizer. You can change colors, spacing and fonts without having to write a single line of code. To get you started, Avenue already provides 8 different style variations to choose from.